Over the past few months I’ve had a number of people ask me for my advice in selecting the right kind of backpack. This is always a difficult question to answer, because what is right for me may not be right for you. Each kind of backpack offers its own distinctive advantages and disadvantages. Thinking through your own backpacking needs should help you in deciding what backpack is right for you. I recently shot a video in which I talked about the backpacks that I own, and why I use what I use. This video might be helpful for you. As mentioned in my video, when I began backpacking in the 90s, the equipment that I carried was heavier and bulkier than it is today. Therefore, at that time I had a need for a bigger, heavier backpack. But things are different today. Water filters, stoves, tents, and cooking equipment have become smaller and lighter. Sleep systems are more efficient, requiring less room and weight. Lightweight, synthetic clothing has really changed what we wear along the trail. 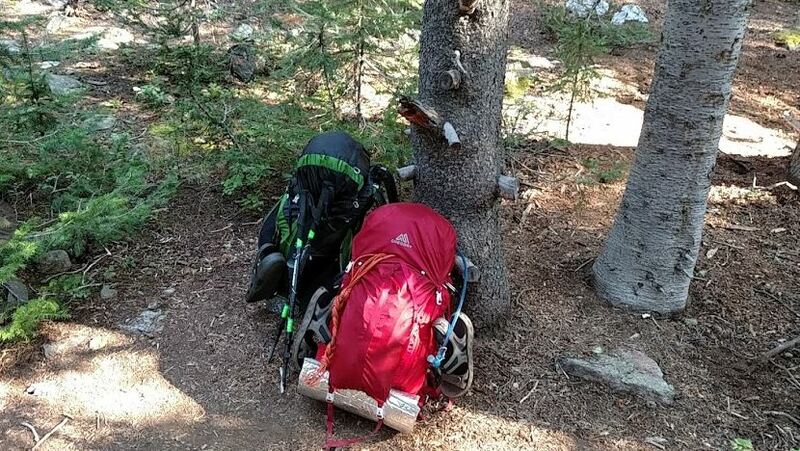 As a result, the need for a roomy backpack has been diminishing for a lot of hikers. What follows are some things to think about in choosing your backpack. For a lot of us, summer hiking means hot days and warm nights. As a result, clothing selections may include shorts, short-sleeved shirts, and trail running shoes. We may ditch the sleeping bag for a lighter blanket, and select a super lightweight tent. These choices generally mean less bulk and weight. We go lighter. Hiking in spring and fall could mean taking a sweater, and adding at least another change of clothing in the event of rain. We may carry a little more. Winter hiking, on the other hand, may radically change the way you pack. From snowshoes to heavy sleeping bags and tents, to multiple sets of clothing, you will find yourself packing a bigger pack. Knowing what season you will be backpacking in will help direct you to the right pack. One of the features that traditional packs offer is comfort. From padded belt pads to airflow channels, to load-bearing frames, these packs were designed to distribute and carry the weight of your pack with ease. Additional features might include handy pockets or webbing for attaching gear or poles. All of these attractive features come with a cost: they make the pack heavier. Ultralight packs were designed with a single purpose in mind: keeping the pack functional while lowering its weight to a minimum. This also comes at a cost: loss of some comforts and conveniences. Which pack is right for you? That’s not something that anyone can say. Your answer to that question must be decided upon by you, based on your needs. Backpack capacity is generally measured in liters or cubic inches. My first big pack was a Gregory Shasta, 80 liter pack. Although needed twenty years ago, it’s now way too much room for me. One of the mistakes that I see people making is buying a pack that has too much capacity for their needs. As a result, they are needlessly carrying lots of extra weight and bulk. Also, excessive room in a pack can cause a load to shift, increasing the risk of throwing one off balance. Currently, my go-to backpack is my Gregory Z-55. The “55” signifies its capacity in liters. I have found for me that 55 liters is enough capacity for a 3-5 day hike during warmer temps. However, it can be too much for single night outs. One the other hand, once temperatures drop, or I am hiking for an extended period of time, 55 liters may not be enough. In that case, I would take my Gregory Zulu 65 liter pack. It provides the extra room needed for the additional demands of these trips. Capacity and load bearing are not the same thing. A 40 liter ultralight backpack will not likely carry the same amount of weight as a 40 liter traditional backpack. Pack manufacturers will generally provide information on how much weight a backpack is designed to carry and still perform well. Your ultralight pack may do well in the summer, but when you make a winter excursion, you may find that it is no longer performing because of the added weight. When buying a backpack, check to see how much weight it can efficiently carry. If possible, the best way to understand your needs is to borrow a friend’s backpack. It will give you a starting place from which to learn your needs and style. Also, some outfitters rent backpacks. This is another good way to begin because they will likely have multiple styles and brands to choose from. Finally, don’t let the opinions of others over-influence you. This is your hike. If you prefer an ultralight pack, then that’s what is best for you. If you lean toward a more traditional backpack, then this is the best one for you. You’ve made the right choice if you find yourself walking contently through the woods.